AutoXten came out of the gate during the summer, amid claims $10 could turn into nearly $200,000. Promos claimed the "opportunity" was using Canada-based AlertPay to avoid PayPal restrictions and that AutoXten was suited for "churches." AutoXTen, the absurd matrix cycler that came to life this summer even as the state of Oregon was issuing a public warning against pyramid schemes and ordering a $345,000 penalty against a cycler pitchman, has gone missing. Prior to the apparent collapse of AutoXTen, remarks attributed to Long on the AutoXTen help desk claimed the program was appropriate for “churches.” DNA made similar claims about one of its “programs” last year. In 2010, Jeff Long's YouTube video for Narc That Car was referenced by Fox News 11 in Los Angeles as part of the station's Narc coverage. The original Narc video was repurposed by Long into a YouTube text pitch for DNA, but later edited to insert an announcement Long had left both Narc and DNA. DNA’s website also has gone missing. The DNA program was associated with MLM huckster Phil Piccolo, as was a program known as One World One Website (OWOW). OWOW emerged last month as a launch ground for the emerging Text Cash Network (TCN) scheme. Despite the appearance online of a photo of a glistening building in Boca Raton, Fla., with the words “TEXT CASH NETWORK” affixed in large letters near the crown of the building, the Boca Raton Police Department said Wednesday that the company’s name does not appear on the building. Questions have been raised about whether Long performs any due diligence on the “opportunities” he embraces or blindly defaults to the company line or manufactures a convenient truth while recruiting participants by the hundreds into scheme after scheme. Long was among the conference-call cheerleaders for DNA, along with Joe Reid, who went on to become a cheerleader for TCN. Reid also was a cheerleader for OWOW, a company Piccolo positioned as the provider of a “magnetic” product that could prevent leg amputations and help tomatoes grow to twice their normal size. 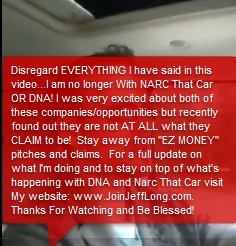 This video in which Jeff Long was driving an automobile and pitching the MLM license-plate schemes of DNA and Narc That Car was edited to insert the red balloon and annoucement from Long that he had dumped both DNA and Narc -- and to warn prospects to stay away from "EZ MONEY'" MLM schemes. Long then turned to AutoXTen amid claims the firm's matrix cycler could turn $10 into nearly $200,000 and was appropriate for "churches." Whether Long participated in OWOW and TCN was not immediately clear. What is clear is that the AutoXTen website is not resolving to a server only months after the purported miracle program’s launch. Both NTC and DNA carded scores of “F” from the Better Business Bureau. Some NTC members then attacked the BBB, and DNA changed the name of one of its purported offerings to “BBB” in an apparent bid to trick search engines. AutoXTen was hawked in part through posts on Ponzi forums such as TalkGold and MoneyMakerGroup. AutoXTen gained a head of steam in part through promos by well-known Ponzi forum pitchmen “Ken Russo” (as “DRdave”), and “manolo,” both of whom also promoted Club Asteria. Club Asteria, which purports to have a philanthropic arm, suspended member payouts months ago and acknowledged its PayPal account had been suspended. An AutoXTen email attributed to Long, Scott Chandler and Brent Robinson as the opportunity’s “Founders/Owners” also shows the firm traded on U.S. patriotism. “This weekend here in the United States of America, we celebrate our freedom and independence as a nation and a Country,” the email read in part. The email was posted on the TalkGold Ponzi forum by “manolo” on July 1, 2011, during the run-up to the Independence Day holiday in the United States. “We want to wish EVERYONE a HAPPY Independence weekend, please be safe, have fun and as you are celebrating, know that you are also celebrating your new life should you choose to step into it here with AutoXTen!” another part of the email exclaimed.